It's October 3rd and you know what that means! It's all out Halloween prep mode around here. 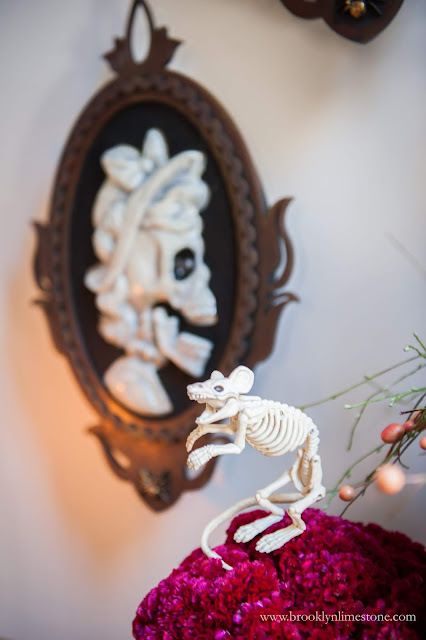 I won't be putting up my exterior decorations until middle of October but I couldn't help put a little spooky fun inside so I could join in the Halloween Home Tour fun (scroll down to the bottom to see lots more fabulous Halloween homes). 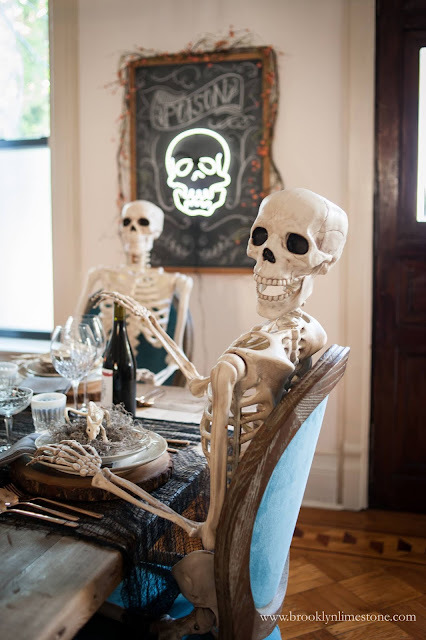 In case you are wondering, both of the kids just love their "skellies" and say 'hi' to them as if they were an old family friends. 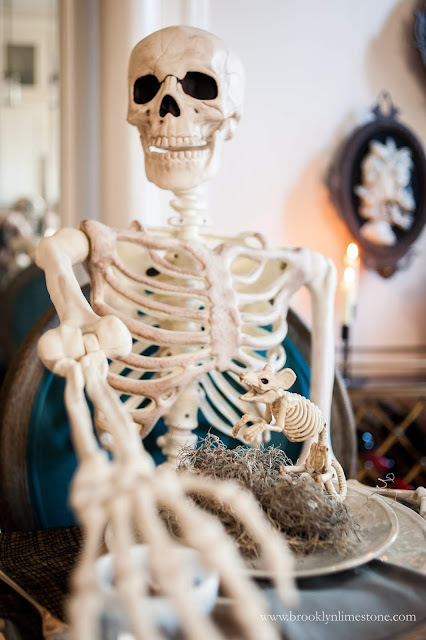 This dinner party is so dead, alternate title: Me, waiting for my kids to finish eating would be fitting here. Feel free to add your own captions. disclosure: Lowes provided the supplies for some of the items in this post but all of the opinions expressed are my own. The centerpiece was super easy. 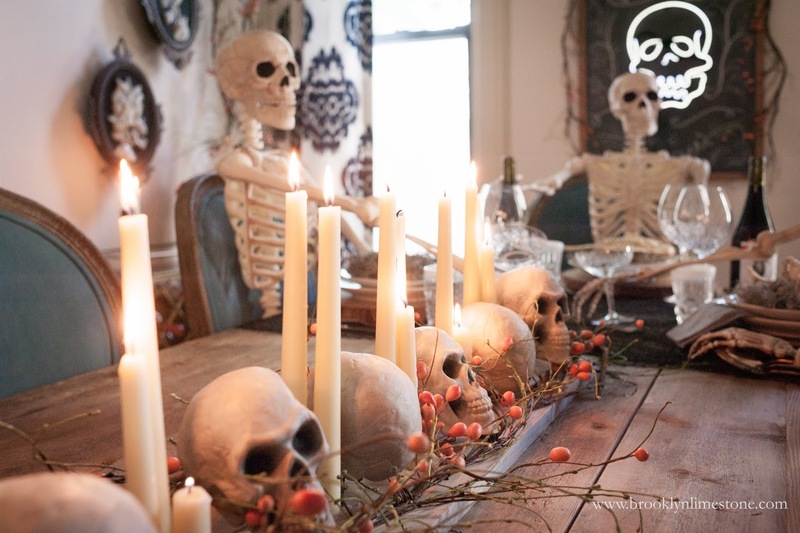 I arranged a wooden board with taper candles, 2 fall berry garlands and a bag of plastic skulls using hot glue. It set the scene and required no special arranging skills. I hung the male and female victorian style talking silhouettes over the wine stand and they made the perfect artwork. And yes, they do talk which is totally fun when the living guests arrive. Aren't they perfect? 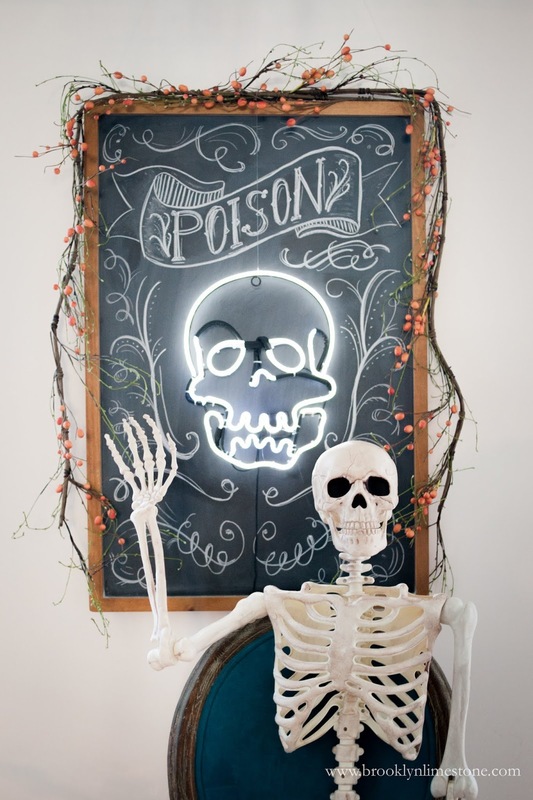 My favorite element was definitely this LED skull light that blinks a bit to give it that abandoned neon sign look (you'll be seeing it again in my outdoor decorations). I decided to embellish it a bit by hanging it in front of the chalkboard to make a bigger impact and then hanging more of the berry garlands around it. It makes the whole dining room glow when all the lights are off which is especially eerie. 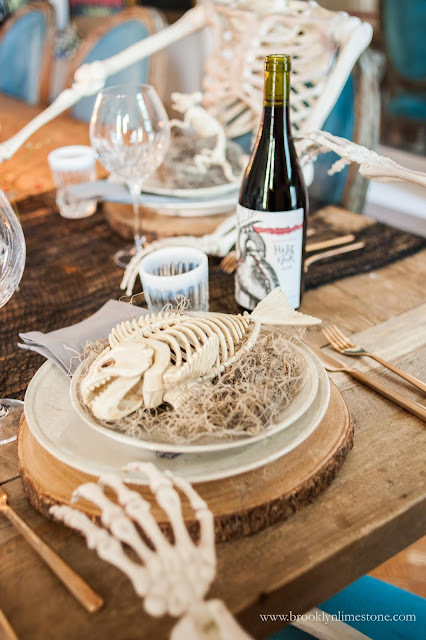 A few finishing touches like these skeleton fish filet, my free printable halloween wine labels and a bunch of cockscomb picked up from the corner bodega completed the look. 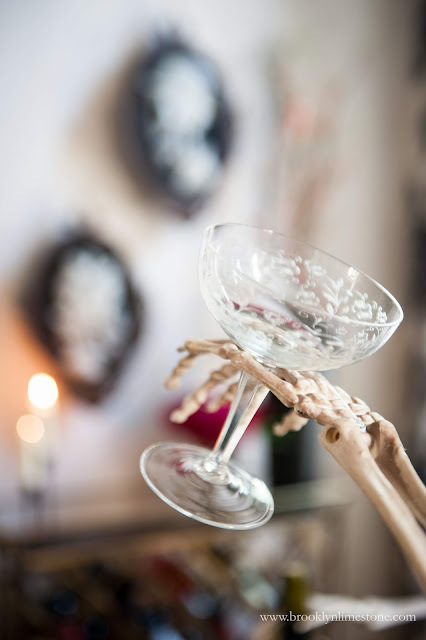 I hope you enjoyed a little party to celebrate the start of my favorite month. 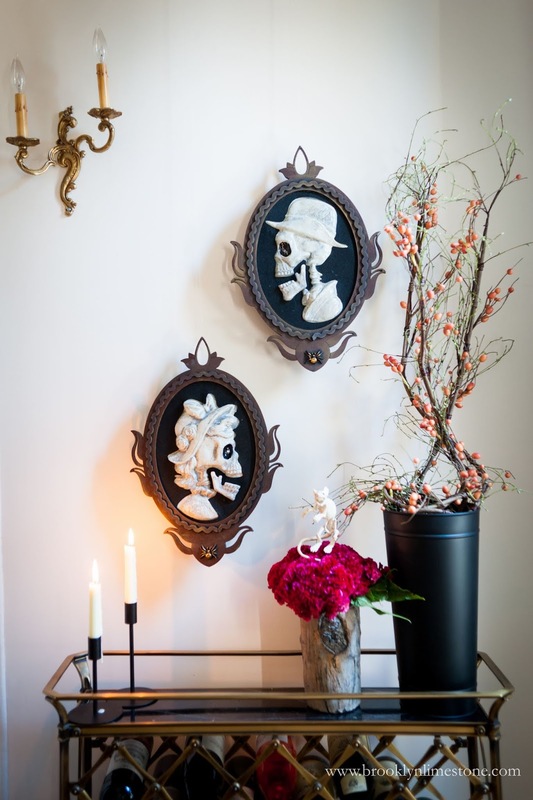 For lots more inspiration, stop by all the lovely inspiration on Ella Claire's Halloween Home Tour. 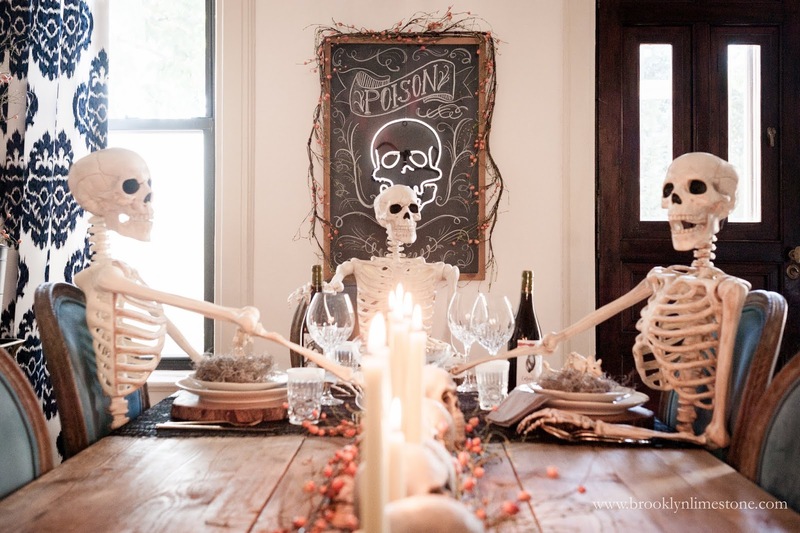 Love your dead dinner party! Very clever! Thanks Jennifer! Looks like we both had skeletons on the brain! LOVE it Stef! Off to find my hot glue gun! 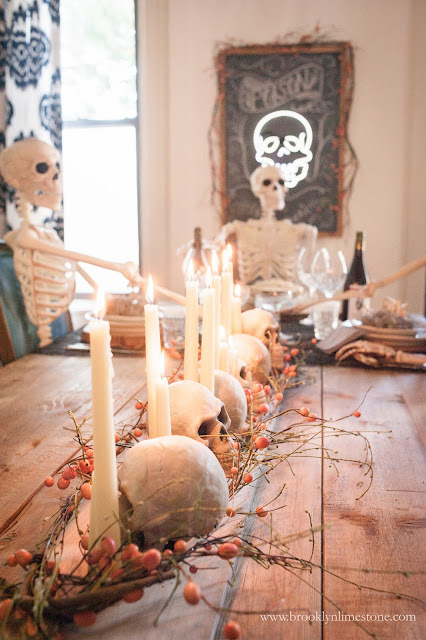 So creative, I bet my kids would love to come to this dinner party. Reminds me of the goonies a bit. LOVE IT!!! Happy to be on this home tour with ya! Thanks so much! You have such beautiful pieces in your home. Such a great backdrop for pumpkins! This is truly the BEST! The fish filet kills me! hahaha! Every last detail didn't go unnoticed. Just SO GOOD!! This is amazing! I love that sign you created with the creepy LED lighting. Thanks so much! I did the surrounding design freehand so I'm pretty proud of it myself. But the flashing LED is really what makes it! Thanks for noticing. I'm all about those little small details. Bonus: My 2 year is obsessed with that skeleton fish and carries it around like a lovey. 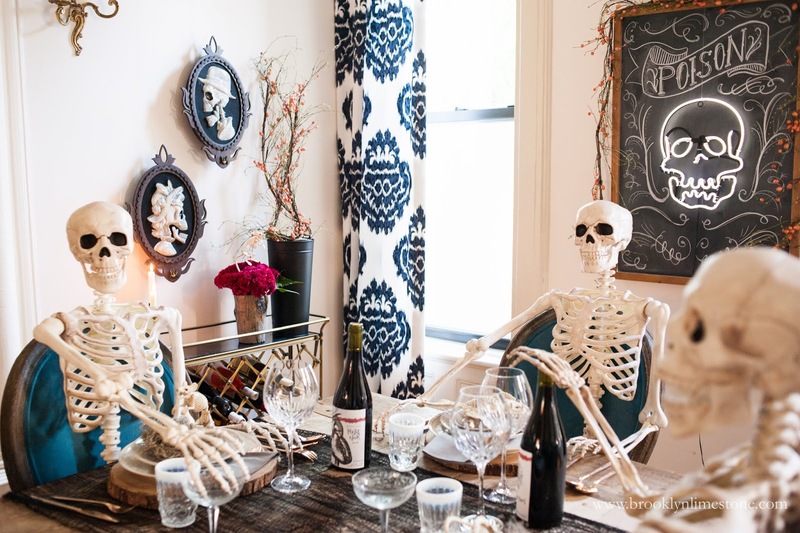 Your skellies look like they are having such a great time! :) How fun! Thanks so much Emily. It's a fun scene to walk into as well. Amazing! So much better than anything else in the round-up! You are too sweet. I'm in some pretty amazing company here. This is so great! I bet your kids love it! I love halloween so much!